President Recep Tayyip Erdoğan said Sunday he will hold a summit with his Russian counterpart Vladimir Putin in the Black Sea resort town of Sochi on Feb. 14. Russia's RIA news agency cited the Kremlin as saying Sunday that Putin would meet Erdoğan and Iranian counterpart Hassan Rouhani in Sochi on Feb. 14. The summit is expected to address the situation in Syria, where Russia and Turkey have been trying to create a de-escalation zone. Erdoğan and Putin held their first meeting of 2019 on Jan. 23 in Moscow. The two leaders discussed a political solution to the Syrian crisis, centered around the Astana process, sponsored by the two countries and Iran. The presidents assured that Turkey and Russia didn't have any disagreements about a planned safe zone in northern Syria and were on the same page regarding the Syrian constitutional committee. Erdoğan on Sunday gave a live interview with Turkish broadcaster TRT. In the interview, Erdoğan discussed Turkey's strategies against terrorists east of the Euphrates in Syria. "In Turkey's policy in northern Syria, Syria's territorial integrity and political unity are essential at this point. We are not in favor of the disintegration of the Syrian people," he said, adding that some 300,000 Syrian refugees have been able to return home from Turkey. Turkey currently hosts some 3.6 million Syrian refugees, according to estimates. 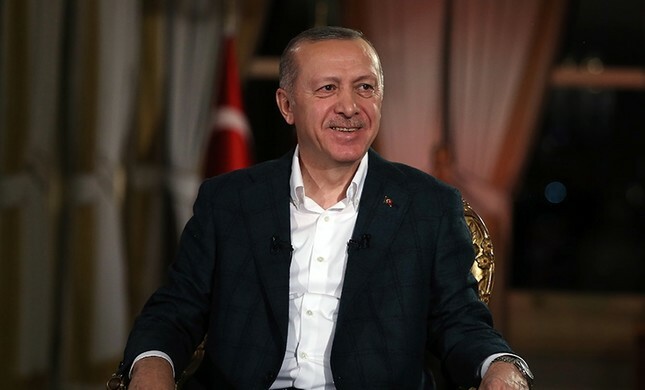 Noting that steps have been taken with Russia regarding patrols around the northern Syrian town of Manbij, Erdoğan announced that a Turkish delegation had returned from Russia for talks on Syria which had resulted in "positive developments." "I hope this positive development will lead to the exit of these (terrorist) organizations leaving this place as soon as possible and its rightful owners will come and settle in their lands," he said. Erdoğan also discussed United States' involvement in Syria, saying: "(Donald) Trump has promised that the U.S. will leave Syria soon. I hope he keeps his promise. Likewise, we do not want to live under threat." "Control over the planned buffer zone in northern Syria must be surrendered to Turkey. Then we will be able to provide security and everything (necessary for the region)," Erdoğan said. Erdoğan also touched on the relationship between Turkey's Peoples' Democratic Party (HDP) and the PKK terrorist group. "HDP equals PKK, YPG and PYD," Erdoğan said, referring to the PKK's Syrian branches People's Protection Units (YPG) and Democratic Union Party (PYD). Asked about the U.S. government's actions in regard to Gülenist Terror Group (FETÖ), whose leader Fetullah Gülen resides in Pennsylvania, Erdoğan said Washington could make a decision now that the FBI has completed probes into terror group members in the U.S.
On the murder of Saudi journalist Jamal Khashoggi, Erdoğan said that he listened to the sound recording of Khashoggi's killing. "I cannot understand the U.S.' silence (on this issue)," he said, adding that Saudi Arabia must provide answers regarding the 22 people responsible for Khashoggi's death, including 15 who had arrived in Turkey. Agnes Callamard, the U.N. special rapporteur on extrajudicial, summary or arbitrary executions, visited Turkey last week to begin an international investigation into the murder of the journalist. Erdoğan also discussed the stability of the Turkish economy, stating that investment would continue. He pointed to the Turkish stock market, which hit a peak over 100 points, as an indicator that Turkey is a "place to go" for investment. "Turkey's exports have risen to $168 billion from $36 billion since 2002," he added.